Last year my husband Bill and I attended a party catered by the Bistro 60 Restaurant at the Golf Club at Trilogy in La Quinta. They did a great job, but we kept forgetting to go see them at the restaurant. Well, we finally made it a couple of weeks ago and it was really good. In fact, we went back two nights in a row. Bistro 60 is a casual setting where you can get breakfast, lunch or dinner, seven nights a week. Bistro 60 is best known for its laid-back atmosphere, great service, and fresh, eclectic food. They use local farm-raised vegetables, quality meats, and Santa Monica seafood. They also offer theme nights and live music in the evenings Wednesday through Saturday. I had the Pear Salad of mixed greens, almonds, grape tomatoes and Brie in a Guava Vinaigrette both nights. It was perfectly dressed, and the pear was excellent. Bill had the Caesar salad which was good but if you don’t like anchovies then you probably won’t like it as it tastes as if they are added to the dressing even though it doesn’t come with them on it. Sheri at the Bistro 60 barWe both had the Bistro Fish N’ Chips the first night. It’s not something that we normally have, but our waiter sold us on it. We were not disappointed. They were light and flaky and not a bit of grease. They coat their Cod fish in a Stella Beer Batter and Chipotle Tempura served with a Jalapeno Tartar Sauce and French Fries. The next night I had a perfectly cooked Pan Seared Steelhead Salmon served in a Spanish Achiote-Seasoned Beurre Blanc, with Cilantro Risotto and Squash. Great! Bill tried the New Zealand Lamb Chops in a Mojito Demi Glace, served with Garlic Mashed Potatoes and the Chef’s Choice of Fresh Vegetables. Bill switched out the potatoes for Asparagus, which the chef was happy to do. For Dessert, (it is a three-course menu after all) I had the Butterscotch Crème Brulee both nights and it was very nice. Tasted just like regular Crème Brulee though. I didn’t detect any butterscotch. Bill had the Flourless Chocolate Cake, which was a very dense slab of chocolate. I like chocolate as much as the next gal, but it was a little too rich for me. The second night Bill had the Tiramisu that was good, but I’ll be sticking to the Crème Brulee. Both nights had good live entertainment. We heard a husband and wife duo one night and a keyboard player the next. Nice, relaxing dinner music which was a welcome change. Overall the food was very good, the service was welcoming and efficient, and the staff actually act like they enjoy working there. 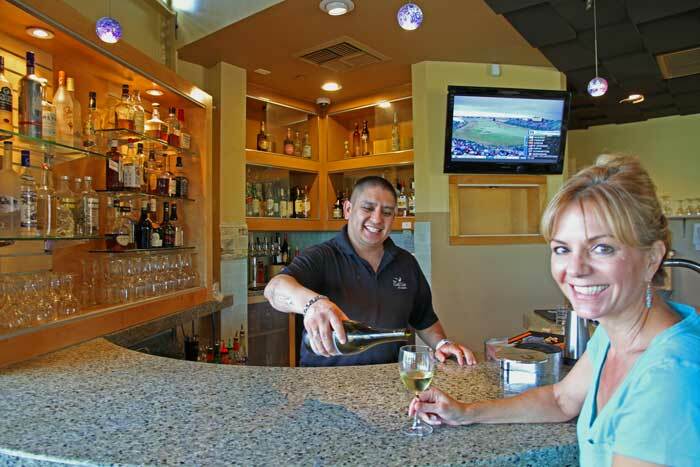 The Bistro 60 prices are hard to beat as well, and the views of the golf course and nearby mountains add to the experience. We'll be back!